"TIME" redirects here. For time as a measure, see Time. For other uses, see Time (disambiguation). Not to be confused with The Times. Time is an American weekly news magazine and news website published in New York City. It was founded in 1923 and originally run by Henry Luce. A European edition (Time Europe, formerly known as Time Atlantic) is published in London and also covers the Middle East, Africa, and, since 2003, Latin America. An Asian edition (Time Asia) is based in Hong Kong. The South Pacific edition, which covers Australia, New Zealand, and the Pacific Islands, is based in Sydney. In December 2008, Time discontinued publishing a Canadian advertiser edition. Time has the world's largest circulation for a weekly news magazine. The print edition has a readership of 26 million, 20 million of whom are based in the United States. In mid-2012, its circulation was over three million, which had lowered to two million by late 2017. Richard Stengel was the managing editor from May 2006 to October 2013, when he joined the U.S. State Department. Nancy Gibbs was the managing editor from September 2013 until September 2017. She was succeeded by Edward Felsenthal, who had been Time's digital editor. The first issue of Time (March 3, 1923), featuring Speaker Joseph G. Cannon. Time magazine was created in 1923 by Briton Hadden and Henry Luce, making it the first weekly news magazine in the United States. The two had previously worked together as chairman and managing editor, respectively, of the Yale Daily News. They first called the proposed magazine Facts. They wanted to emphasize brevity, so that a busy man could read it in an hour. They changed the name to Time and used the slogan "Take Time–It's Brief". Hadden was considered carefree and liked to tease Luce. He saw Time as important, but also fun, which accounted for its heavy coverage of celebrities (including politicians), the entertainment industry, and pop culture—criticized as too light for serious news. It set out to tell the news through people, and for many decades, the magazine's cover depicted a single person. More recently, Time has incorporated "People of the Year" issues which grew in popularity over the years. Notable mentions of them were Barack Obama, Steve Jobs, etc. 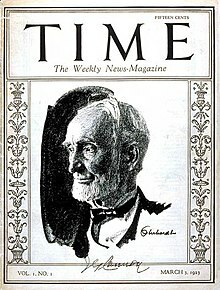 The first issue of Time was published on March 3, 1923, featuring Joseph G. Cannon, the retired Speaker of the House of Representatives, on its cover; a facsimile reprint of Issue No. 1, including all of the articles and advertisements contained in the original, was included with copies of the February 28, 1938 issue as a commemoration of the magazine's 15th anniversary. The cover price was 15¢ (equivalent to $2.21 in 2018) On Hadden's death in 1929, Luce became the dominant man at Time and a major figure in the history of 20th-century media. According to Time Inc.: The Intimate History of a Publishing Enterprise 1972–2004 by Robert Elson, "Roy Edward Larsen [...] was to play a role second only to Luce's in the development of Time Inc". In his book, The March of Time, 1935–1951, Raymond Fielding also noted that Larsen was "originally circulation manager and then general manager of Time, later publisher of Life, for many years president of Time Inc., and in the long history of the corporation the most influential and important figure after Luce". Around the time they were raising $100,000 from wealthy Yale alumni such as Henry P. Davison, partner of J.P. Morgan & Co., publicity man Martin Egan and J.P. Morgan & Co. banker Dwight Morrow, Henry Luce, and Briton Hadden hired Larsen in 1922 – although Larsen was a Harvard graduate and Luce and Hadden were Yale graduates. After Hadden died in 1929, Larsen purchased 550 shares of Time Inc., using money he obtained from selling RKO stock which he had inherited from his father, who was the head of the Benjamin Franklin Keith theatre chain in New England. However, after Briton Hadden's death, the largest Time, Inc. stockholder was Henry Luce, who ruled the media conglomerate in an autocratic fashion, "at his right hand was Larsen", Time's second-largest stockholder, according to Time Inc.: The Intimate History of a Publishing Enterprise 1923–1941. In 1929, Roy Larsen was also named a Time Inc. director and vice president. J. P. Morgan retained a certain control through two directorates and a share of stocks, both over Time and Fortune. Other shareholders were Brown Brothers W. A. Harriman & Co., and the New York Trust Company (Standard Oil). The Time Inc. stock owned by Luce at the time of his death was worth about $109 million, and it had been yielding him a yearly dividend of more than $2.4 million, according to Curtis Prendergast's The World of Time Inc.: The Intimate History of a Changing Enterprise 1957–1983. The Larsen family's Time stock was worth around $80 million during the 1960s, and Roy Larsen was both a Time Inc. director and the chairman of its executive committee, later serving as Time's vice chairman of the board until the middle of 1979. According to the September 10, 1979, issue of The New York Times, "Mr. Larsen was the only employee in the company's history given an exemption from its policy of mandatory retirement at age 65." After Time magazine began publishing its weekly issues in March 1923, Roy Larsen was able to increase its circulation by using U.S. radio and movie theaters around the world. It often promoted both Time magazine and U.S. political and corporate interests. According to The March of Time, as early as 1924, Larsen had brought Time into the infant radio business with the broadcast of a 15-minute sustaining quiz show entitled Pop Question which survived until 1925". Then, in 1928, Larsen "undertook the weekly broadcast of a 10-minute programme series of brief news summaries, drawn from current issues of Time magazine [...] which was originally broadcast over 33 stations throughout the United States". Larsen next arranged for a 30-minute radio program, The March of Time, to be broadcast over CBS, beginning on March 6, 1931. Each week, the program presented a dramatisation of the week's news for its listeners, thus Time magazine itself was brought "to the attention of millions previously unaware of its existence", according to Time Inc.: The Intimate History of a Publishing Enterprise 1923–1941, leading to an increased circulation of the magazine during the 1930s. Between 1931 and 1937, Larsen's The March of Time radio program was broadcast over CBS radio and between 1937 and 1945 it was broadcast over NBC radio – except for the 1939 to 1941 period when it was not aired. People Magazine was based on Time's People page. In 1989, when Time, Inc. and Warner Communications merged, Time became part of Time Warner, along with Warner Bros. In 1988, Jason McManus succeeded Henry Grunwald as editor-in-chief and oversaw the transition before Norman Pearlstine succeeded him in 1995. In 2000, Time became part of AOL Time Warner, which reverted to the name Time Warner in 2003. In 2007, Time moved from a Monday subscription/newsstand delivery to a schedule where the magazine goes on sale Fridays, and is delivered to subscribers on Saturday. The magazine actually began in 1923 with Friday publication. During early 2007, the year's first issue was delayed for roughly a week due to "editorial changes", including the layoff of 49 employees. In 2009, Time announced that they were introducing a personalized print magazine, Mine, mixing content from a range of Time Warner publications based on the reader's preferences. The new magazine met with a poor reception, with criticism that its focus was too broad to be truly personal. The magazine has an online archive with the unformatted text for every article published. The articles are indexed and were converted from scanned images using optical character recognition technology. The minor errors in the text are remnants of the conversion into digital format. In January 2013, Time Inc. announced that it would cut nearly 500 jobs – roughly 6% of its 8,000 staff worldwide. Although Time magazine has maintained high sales, its ad pages have declined significantly over time. Also in January 2013, Time Inc. named Martha Nelson as the first female editor-in-chief of its magazine division. In September 2013, Nancy Gibbs was named as the first female managing editor of Time magazine. In November 2017, Meredith Corporation announced its acquisition of Time, Inc., backed by Koch Equity Development. In March 2018, only six weeks after the closure of the sale, Meredith announced that it would explore the sale of Time and sister magazines Fortune, Money, Sports Illustrated, since they did not align with the company's lifestyle brands. In September 2018, Meredith announced that it would re-sell Time to Marc Benioff and his wife Lynne for $190 million, which was completed on October 31, 2018. Although Benioff is the chairman and co-CEO of Salesforce.com, Time will remain separate from the company, and Benioff will not be involved in its daily operations. During the second half of 2009, the magazine had a 34.9% decline in newsstand sales. During the first half of 2010, another decline of at least one-third in Time magazine sales occurred. In the second half of 2010, Time magazine newsstand sales declined by about 12% to just over 79,000 copies per week. As of 2012, it has a circulation of 3.3 million, making it the 11th-most circulated magazine in the United States, and the second-most circulated weekly behind People. As of July 2017, its circulation is 3,028,013. In October 2017, Time cut its circulation to two million. Time initially possessed a distinctive writing style, making regular use of inverted sentences. This was parodied in 1936 by Wolcott Gibbs in The New Yorker: "Backward ran sentences until reeled the mind [...] Where it all will end, knows God!" Until the mid-1970s, Time had a weekly section called "Listings", which contained capsule summaries and/or reviews of then-current significant films, plays, musicals, television programs, and literary bestsellers similar to The New Yorker's "Current Events" section. The issue released shortly after the September 11 attacks on the United States featured a black border to symbolize mourning. However, this was a special "extra" edition published quickly for the breaking news of the event; the next regularly scheduled issue contained the red border. The April 28, 2008 Earth Day issue, dedicated to environmental issues, contained a green border. The September 19, 2011 issue, commemorating the 10th anniversary of September 11 attacks, had a metallic silver border. Another silver border was used in the December 31, 2012 issue, noting Barack Obama's selection as Person of the Year. The most recent change was the November 28/December 5, 2016 issue, also featuring a silver border covering the Most Influential Photos of All Time. Former president Richard Nixon has been among the most frequently-featured on the front page of Time, having appeared 55 times from the August 25, 1952 issue to the May 2, 1994 issue. In 2007, Time engineered a style overhaul of the magazine. Among other changes, the magazine reduced the red cover border to promote featured stories, enlarged column titles, reduced the number of featured stories, increased white space around articles, and accompanied opinion pieces with photographs of the writers. The changes have met both criticism and praise. Time's most famous feature throughout its history has been the annual "Person of the Year" (formerly "Man of the Year") cover story, in which Time recognizes the individual or group of individuals who have had the biggest impact on news headlines over the past 12 months. The distinction is supposed to go to the person who, "for good or ill", has most affected the course of the year; it is, therefore, not necessarily an honor or a reward. In the past, such figures as Adolf Hitler and Joseph Stalin have been Man of the Year. In 2006, Person of the Year was designated as "You", a move that was met with split reviews. Some thought the concept was creative; others wanted an actual person of the year. Editors Pepper and Timmer reflected that, if it had been a mistake, "we're only going to make it once". In 2017, Time named The Silence Breakers, women and men who came forward with personal stories of sexual harassment, as Person of the Year. In recent years, Time has assembled an annual list of the 100 most influential people of the year. Originally, they had made a list of the 100 most influential people of the 20th century. These issues usually have the front cover filled with pictures of people from the list and devote a substantial amount of space within the magazine to the 100 articles about each person on the list. In some cases, over 100 people have been included, as when two people have made the list together, sharing one spot. The magazine also compiled "All-TIME 100 best novels" and "All-TIME 100 best movies" lists in 2005, "The 100 Best TV Shows of All-TIME" in 2007, and "All-TIME 100 Fashion Icons" in 2012. In February 2016, Time included the British and male author Evelyn Waugh on its "100 Most Read Female Writers in College Classes" list (he was 97th on the list) which created much media attention and concerns about the level of basic education among the magazine's staff. Time later issued a retraction. In a BBC interview with Justin Webb, Professor Valentine Cunningham of Corpus Christi College, Oxford, described the mistake as "a piece of profound ignorance on the part of Time magazine". During its history, on five nonconsecutive occasions, Time has released a special issue with a cover showing an X scrawled over the face of a man or a national symbol. The first Time magazine with a red X cover was released on May 7, 1945, showing a red X over Adolf Hitler's face. The second X cover was released more than three months later on August 20, 1945, with a black X (to date, the magazine's only such use of a black X) covering the flag of Japan, representing the recent surrender of Japan and which signaled the end of World War II. Fifty-eight years later, on April 21, 2003, Time released another issue with a red X over Saddam Hussein's face, two weeks after the invasion. On June 13, 2006, Time magazine printed a red X cover issue following the death of Abu Musab al-Zarqawi in a U.S. airstrike in Iraq. The most recent red X cover issue of Time was published on May 2, 2011, after the death of Osama bin Laden. Time for Kids is a division magazine of Time that is especially published for children and is mainly distributed in classrooms. TFK contains some national news, a "Cartoon of the Week", and a variety of articles concerning popular culture. An annual issue concerning the environment is distributed near the end of the U.S. school term. The publication rarely exceeds ten pages front and back. Time LightBox is a photography blog created and curated by Time's photo department that was launched in 2011. In 2011, Life picked LightBox for its Photo Blog Awards. In 1940, William Saroyan lists the full Time editorial department in the play, Love's Old Sweet Song. Contributing Editors: Roy Alexander, John F. Allen, Robert W. Boyd Jr., Roger Butterfield, Whittaker Chambers, James G. Crowley, Robert Fitzgerald, Calvin Fixx, Walter Graebner, John Hersey, Sidney L. James, Eliot Janeway, Pearl Kroll, Louis Kronenberger, Thomas K. Krug, John T. McManus, Sherry Mangan, Peter Matthews, Robert Neville, Emeline Nollen, Duncan Norton-Taylor, Sidney Olson, John Osborne, Content Peckham, Green Peyton, Williston C. Rich Jr., Winthrop Sargeant, Robert Sherrod, Lois Stover, Leon Svirsky, Felice Swados, Samuel G. Welles Jr., Warren Wilhelm, and Alfred Wright Jr.
Editorial Assistants: Ellen May Ach, Sheila Baker, Sonia Bigman, Elizabeth Budelrnan, Maria de Blasio, Hannah Durand, Jean Ford, Dorothy Gorrell, Helen Gwynn, Edith Hind, Lois Holsworth, Diana Jackson, Mary V. Johnson, Alice Lent, Kathrine Lowe, Carolyn Marx, Helen McCreery, Gertrude McCullough, Mary Louise Mickey, Anna North, Mary Palmer, Tabitha Petran, Elizabeth Sacartoff, Frances Stevenson, Helen Vind, Eleanor Welch, and Mary Welles. ^ a b c d "Consumer Magazines". Alliance for Audited Media. Retrieved October 6, 2016. ^ "Time Canada to close". Mastheadonline.com. December 10, 2008. Retrieved September 6, 2011. ^ a b c Byers, Dylan (August 7, 2012). "Time Magazine still on top in circulation". Politico. Retrieved October 8, 2018. ^ Trachtenberg, Jeffrey A. (October 10, 2017). "For Time Inc.'s Magazines, Fewer Copies Is the Way Forward" – via www.wsj.com. ^ Time Inc (July 30, 2012). "Richard Stengel". TIME Media Kit. Time Inc. Archived from the original on March 5, 2012. Retrieved August 22, 2012. ^ a b Maza, Erik (September 17, 2013). "Nancy Gibbs Named Time's Managing Editor". WWD. Retrieved September 17, 2013. ^ "Time magazine names Edward Felsenthal as new editor-in-chief". ^ "History of TIME". Time. ^ "Instant History: Review of First Issue with Cover". Brycezabel.com. March 3, 1923. Retrieved January 26, 2014. ^ "- The Washington Post". Washington Post. ISSN 0190-8286. Retrieved May 29, 2018. ^ "Time Inc. Layoffs: Surveying the Wreckage". Gawker. Retrieved December 15, 2007. ^ "Time's foray into personal publishing". April 27, 2009. Archived from the original on April 30, 2009. Retrieved December 15, 2007. ^ Adams, Russell (May 2, 2011). "WSJ.com, Time Inc. in iPad Deal With Apple". Online.wsj.com. Retrieved January 26, 2014. ^ "Time Inc. Cutting Staff", Wall Street Journal, January 30, 2013. Retrieved February 12, 2013. ^ "Time Inc to Shed 500 Jobs", Greenslade Blog, The Guardian, January 31, 2013. Retrieved February 12, 2013. ^ a b Haughney, Christine (September 17, 2013). "Time Magazine Names Its First Female Managing Editor". The New York Times. ^ Ember, Sydney; Ross, Andrew (November 26, 2017). "Time Inc. Sells Itself to Meredith Corp., Backed by Koch Brothers". The New York Times. Retrieved November 27, 2017. ^ Spangler, Todd (March 21, 2018). "Meredith Laying Off 1,200, Will Explore Sale of Time, SI, Fortune and Money Brands". Variety. Retrieved March 22, 2018. ^ Shu, Catherine (September 17, 2018). "Marc and Lynne Benioff will buy Time magazine from Meredith for $190M". TechCrunch. Retrieved September 17, 2018. The sale was completed on October 31, 2018. ^ Clifford, Stephanie (February 8, 2010). "Magazines' Newsstand Sales Fall 9.1 Percent". The New York Times. ^ The New Yorker - Google Books. Books.google.com. Retrieved January 26, 2014. ^ "TIME Magazine archives". Time. ^ Lin, Tao (September 21, 2010). "Great American Novelist". TheStranger.com. Retrieved May 30, 2011. ^ MSNBC-TV report by Andrea Mitchell, April 17, 2008, 1:45 pm . ^ "Watch: The Rise and Fall of Richard Nixon in TIME Covers". Time. Retrieved September 17, 2018. ^ Hagan, Joe (March 4, 2007). "The Time of Their Lives". NYMag.com. New York Magazine. Retrieved August 22, 2012. ^ Nussbaum, Bruce (March 25, 2007). "Does The Redesign of Time Magazine Mean It Has A New Business Model As Well?". Bloomberg Businessweek. BLOOMBERG L.P. Retrieved August 22, 2012. ^ Will, George F. (December 21, 2006). "Full Esteem Ahead". The Washington Post. ^ "The Time of Their Lives". Retrieved April 22, 2007. ^ "Time's Person of the Year: 'Silence Breakers' speaking out against sexual harassment". ^ Corliss, Richard; Schickel, Richard (February 12, 2005). "All-TIME 100 Movies". Time. ^ "Best Soundtracks". Time. February 12, 2005. ^ Corliss, Richard (June 2, 2005). "That Old Feeling: Secrets of the All-Time 100". Time. Archived from the original on August 11, 2010. ^ Poniewozik, James (September 6, 2007). "The 100 Best TV Shows of All-TIME". Time. ^ "All-TIME 100 Fashion Icons". Time. April 2, 2012. ^ "Evelyn Waugh: 'Time' Names Male Writer In List Of '100 Most Read Female Authors'". February 25, 2016. ^ "Time magazine correction: Evelyn Waugh was not a woman". February 26, 2016 – via www.bbc.com. ^ Gustini, Ray (May 2, 2011). "A Brief History of Time Magazine's 'X' Covers". The Wire. ^ Laurent, Olivier (July 31, 2013). "Changing Time: How LightBox has renewed Time's commitment to photography". British Journal of Photography. Retrieved January 6, 2015. ^ "Guide to the Time Inc. Records Overview 1853-2015". New-York Historical Society. July 23, 2018. Retrieved October 8, 2018. ^ Blackman, Ann. "Ann Blackman – Off to Save the World: How JULIA TAFT Made a Difference". Promotional website. Retrieved January 28, 2012. ^ Saroyan, William (1940). Love's Old Sweet Song: A Play in Three Acts. Samuel French. pp. 71–73. Retrieved July 15, 2017. This page is based on the Wikipedia article Time (magazine); it is used under the Creative Commons Attribution-ShareAlike 3.0 Unported License (CC-BY-SA). You may redistribute it, verbatim or modified, providing that you comply with the terms of the CC-BY-SA.